Reciting the Quran with correct tajweed (rules of recitation) fills the heart with solace, the soul with peace and the house with blessings. It makes you feel close to Allah, and alleviates any sorrow or grief due to its immediate stress-relieving effects. Daily recitation of a few pages of the Quran, especially after Fajr prayer, is the best remedy for keeping oneself on the path of righteousness tied to the rope of Allah. Reading is one of the most fulfilling pastimes, pursued by millions with zeal. What better to read on a relaxing day than the Quran or its explanation? A good understanding of reality can be obtained if the Quran is understood by reading its translation and exegesis (tafsir), written by a knowledgeable and specialized scholar, as exegesis helps reveal the secrets of the Quran and sheds light on the hidden meanings of the words, verses and surahs. Having Divine words ensconced in your heart enables you to hum them to yourself when feeling low and to stand in long deep supererogatory prayers at night. Moreover, it makes you feel especially close to Allah when, as you witness incidents in daily life, He replays relevant Quranic words in your mind granting you insight into the reality of the life of this world. Whether it’s listening to a Quran recitation or to a scholarly lecture explaining it, whilst traveling in a car, surfing the internet, or attending a live class at an institute or a mosque, one of the best ways of reflecting upon the Quran is listening to it intently when someone reads it and explains it aloud to you. Any student of Islamic knowledge would testify to the “on-high” feeling of enlightenment that follows a Quran class. 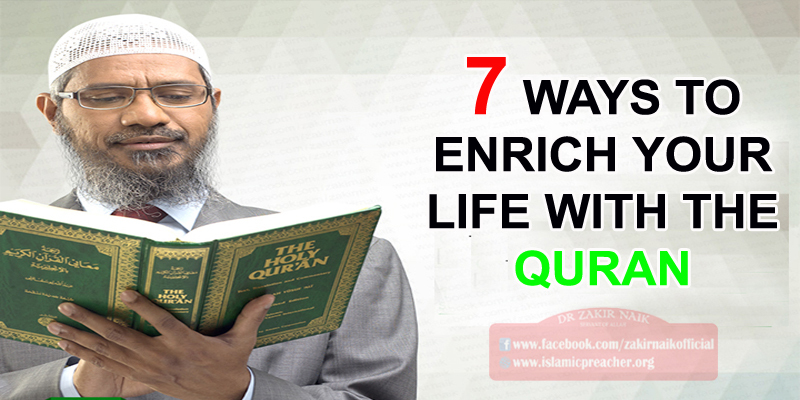 The Quran should be adhered to in our daily life; it is a Book sent as guidance for all mankind. Therefore, all other acts of worship related to the Quran would be of little avail; rather, they could actually bear witness against Muslims on the Day of Judgment, if they did not act upon its commands, or did not intend to act upon them when pursuing its knowledge. From fulfilling covenants, taking loans, leaving behind inheritance, responding to evil with good, tying the nuptial knot, and calling to Islam; to principles of raising pious children and giving charity – the Quran provides complete guidance to Muslims, on how to lead a peaceful life individually and communally. It sounds very fancy to say, “I teach the Quran”, but in reality, propagating the Quran can be as simple as inviting a few friends over for tea, and reading a number of ayahs out to them in Arabic, followed by translation and exegesis over a period of half an hour. Everyone can then discuss how to apply what they have learned to their lives. The short surahs of the Quran may be covered, or it may be taught chronologically in its entirety. The point is to open up the Quran for da`wah and reflection on a regular basis. The benefits of this activity – teaching it to others – outweigh those of reflecting upon it in seclusion. The bond that binds Muslims together on the basis of studying the Quran together is indescribable. It is sincere and unworldly love, solely for the sake of Allah; one that transcends petty motives or gains. The Quran has filled my life with vibrant colors, enriched my soul with its beneficial knowledge, and guided me to feel the solace of being close to Allah, my Creator. Wouldn’t you also want to go through that beautiful experience?